Here's a thought: say your insurance doesn't cover Lasik surgery. Or dental (or other) implants. But you want (or need) that procedure, and the bank account's running a bit low. Well, if you've got an HSA, or access to an HRA or FSA, then you may have enough to cover the cost (or can get there quickly enough) that it's not an issue. Well then, how about borrowing the money (ah, debt: the American way!) to pay for it? Believe it or not, there's a growing number of folks who are doing just that. And the providers themselves are helping. Anyone who's bought (and financed) a car in the last 50 years knows that the dealership has a "finance guy" just itchin' to talk terms and deals. After all, it's extra profit, and guarantees that the inventory will move. Taking a nod from Crazy Larry's Used Car Emporium, more and more doctors (and, of course, other providers) are offering financing options for their patients. I began to see this a few years ago, when Lasik was $5,000. Per eye. Not many folks could afford that much all at once for what is, generally, an elective procedure. But make it $29.99 (per month), and all of a sudden it becomes a lot more doable. "But as the price of health care continues to rise and big lenders pursue new areas for growth, this type of medical financing has become one of the fastest-growing parts of consumer credit, led by lending giants like Capital One and Citigroup and the CareCredit unit of General Electric." Depending on how one sets it up, there may even be some positive tax results from such deals. According to the Wall Street Journal, "(t)he mortgage-lending market may be a mess, but lending people money to get health care is a booming business." This "new" market is attracting some big names in the financial services sector: Capital One and CitiGroup, for example, are introducing new, zero-percent loans for qualified customers. Like the discount cards we've also discussed, these come with a built-in time bomb: pay off the loan on time, or the rate skyrockets. Still, for folks on a tight budget (or with unfunded high deductibles), these kinds of loans may be appropriate. And it's not just the financiers who are putting these deals together. Insurers are also looking for creative ways to make a few extra bucks. In fact, at least one company is touting a product that encourages (and facilitates) its insureds to take out loans to cover unreimbursed expenses. Is this "a good thing?" It depends, one supposes, on how much more debt a given insured/patient can really handle. And on whether providers will "hard sell" services that may not be medically necessary, in order to bolster their own practice's bottom line. There's another factor at play here, as well. If you've been watching the news, you know that the credit market is taking a tumble, and "creditworthiness is starting to be judged even more stringently, in light of the subprime mortgage crisis’s impact on the debt markets." So if you want (or need) that non-covered procedure, you'd better be sure that all your other debts are caught up, as well. Oh, and one last thing: as we've discussed before, non-covered medical expenses aren't eligible for in-network pricing, so you're on your own when negototiating both the cost, and the financing, of these procedures. A recurring theme here at IB is the advisability (or lack thereof) of a nationalized, gummint-run health care system. Over the years, we've examined (and dismissed) such systems as the "much vaunted NHS" of our cousins across the pond, the broken and bleeding system of our neighbors to the north, and others. Still, some of our commenters (whose comments are almost always appreciated) insist that there must be some system, somewhere, that "meets the test." Often, they'll point to our Japanese friends as having "gotten it right." "(A) woman in labour was turned away by eight hospitals. A ninth hospital refused to admit her even after she miscarried in an ambulance and her baby died." Turns out, national "free" health care comes with a pretty steep price-tag: rationing. That is, because such systems discourage potential docs from pursuing high risk specialties ("why bother, I'll never make it back? "), appropriate care is often difficult to find. Now, one may argue that we sometimes have similar problems here in the 'States. And one would be right. And wrong: when providers in our "broken, inefficient, smelly system" screw up like this, they're closed down. Period. "Last year a pregnant woman who lived in the same area died after she was refused admission by about 20 hospitals which said their beds were full. The problem is there are neither enough doctors in Japan, nor emergency facilities." Still think we oughta go there? 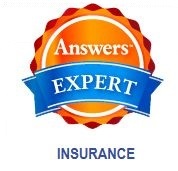 Seen any Pilgrim's (life insurance, that is)? A colleague of mine is trying to help one of his clients, and has asked for my assistance. We're looking for a specific carrier: Pilgrim Life Insurance Company of Indianapolis, Indiana. I've checked with A M Best, and MIB, and the NAIC. Struck out with each and every one. Very few companies actually cease to exist altogether; most of those that have "gone missing" have been gobbled up by larger and larger entities (which will eventually stop once Conseco owns every other carrier). I used to have a link to a site that would have helped (one input the name of the target carrier, and the site would return its most recent owner). Alas, that was apparently several PC's ago, and I can no longer find that link. So, if you've got any suggestions, or know what's become of old PLIC, please let me know, via the comments section (or email), where they ended up. UPDATE: Thanx to our alert and resourceful (not to mention good-looking) readers, we've tracked 'em down. A special Hat Tip to Fred and Rick, both of whom were able to dig up the relevant contact info. There's actually a really cool story behind this company (and the one which bought it); I'll be blogging on that anon. UPDATE THE SECOND: You'll find "the rest of the story" here. It's been a while since we've discussed the role and importance of Long Term Care insurance (LTCi) coverage. But as our population ages (and the "Boomers" are now knock, knock, knockin' on Medicare's door), the need for asset protection becomes more and more critical. And make no mistake about it: LTCi is about protecting assets, not people. In that regard, it's much more closely related to homeowners than life or even health insurance. Well, let's look at it this way: one of the most prevalent uses of life insurance is to replace income. But homeowners insurance is primarily about protecting the asset that is your house (and, of course, its contents). If it were to be burgled, you'd want some help replacing the new plasma TV, and maybe that van Gogh you had hanging on the wall [ed: yeah, riiight!]. If there were a fire, you'd want some help cleaning up the mess, and rebuilding your dream home. In the same way, if you need long term care, you'd want your assets to last as long as possible, to preserve your choices (and, perhaps, your dignity). And that's how LTCi works: it enables you to use less of your own hard-earned money (cash, stocks, whatever) while you receive care that's generally excluded by Medicare. Of course, there's Medicaid, but that requires a costly "spend down" process, which can quickly drain away all those hard-earned dollars. "If you haven't considered long-term care insurance yet, this might be a good time -- and not just because health care costs are spiraling. More and more states are developing long-term care partnership programs that make it easier for you to protect your nest egg." She adds "(t)he cost of long-term health care can easily burn through your life's savings." In fact, according to industry leader Genworth Financial, home health care (let alone in a nursing or other long term care facility) costs an average of $53,000. It's not hard to see how quickly one can "burn through" one's nest egg. As Donna mentions, many states have now set up "partnerships" to encourage (and help) folks to purchase their own coverage. One of the "perks" of these plans is that participants get a break on the Medicaid spend-down rules, which would look primarily to exhaust the policy, not one's bank account. Currently, over a dozen states have set up (or begun to set up) these partnership arrangements, with another 15 or so "on deck." To check to see whether or not your state is on board, check with your professional, independent agent (this kind of insurance is definitely not DIY), or your state's Insurance Department. Cavalcade of Risk #33 is up! Jane Hiebert-White, of the Health Affairs blog, hosts this week's edition, dedicated to the anniversary of the tragedy of Hurricane Katrina. I can think of no more fitting example of all the aspects of risk (assessment, management, you name it) than what happened in NOLA two years ago. (We also have some Fall '07 hosting opportunities available, just drop us a line if you're interested). "The proportion of patients who say they got infected at a hospital counts about the same in the "quality" measure as the proportion of doctors who use automated computer systems to remind them to tell patients their test results. Those things aren't equal in my book." "The report does nothing more than reveal which nation does the worst job of satisfying the subjective preferences of the people who conducted this study." UPDATE & BUMP: Please see the important update at the end of this post. Recently, the results of a new study has been making its way around the medblogosphere, with predictable results: our broken, run-down, leaky, smelly health care system has led us to rank 42nd (internationally) in life expectancy. Quick, someone get me an umbrella: the sky is falling! Contrary to the headlines ("Lack of insurance, obesity, racial disparities to blame"), the mortality rate is not the same as the morbidity rate. The former addresses the number of deaths in a given population, while the latter reflects its health (or lack thereof). While they are, of course, related, correlation is not causation. “Something’s wrong here when one of the richest countries in the world, the one that spends the most on health care, is not able to keep up with other countries,” he sanctimoniously opines. How many illegal (and often unhealthy) aliens are clamoring at the borders of Guam, Japan or Italy? (Clamoring to get in, that is) Think our burgeoning population of such folks might have some effect on our national health care, and mortality, picture? And that's really the point: we'd need a lot more information to tell how much, if anything, the life expectancy numbers have to do with quality of health care. For example, we learn from the CDC that 75 % "of the more than 40,000 deaths each year among persons aged 10-24 years in the United States are related to preventable causes such as motor-vehicle crashes (37%), homicide (14%), suicide (12%), and other injuries (e.g., drowning, poisoning, and burns) (12%). " That's not a reflection on our health care system, but on our priorities and culture. Again according to the CDC, heart disease and cancer account for almost half of all deaths in the US. But how, exactly, does that indict the health care system? We spend enormous sums in research and treatment of these conditions, but if folks won't stop smoking, and start excercising and eating a more healthful diet [ed: hey, you talkin' to me?! ], there's precious little that "the system" can do about it. Not to pile on [ed: riiiight! ], but columnist and TV newsguy John Stossel has more: "The WHO [report] judged a country's quality of health on life expectancy. But that's a lousy measure of a health-care system. Many things that cause premature death have nothing do with medical care. We have far more fatal transportation accidents than other countries. That's not a health-care problem. Similarly, our homicide rate is 10 times higher than in the U.K., eight times higher than in France, and five times greater than in Canada. When you adjust for these "fatal injury" rates, U.S. life expectancy is actually higher than in nearly every other industrialized nation." "Diet and lack of exercise also bring down average life expectancy." Finally, and this is the one that always frosts me, the authors drag out the oft-repeated (and always debunked) canard about our "sky high infant mortality rate." Truth is, the leading cause of infant mortality in the U.S. is "congenital malformations, deformations and chromosomal abnormalities." There's no evidence that our doc's are less capable of dealing with these than physicians in other countries. More importantly, though, is the statistical sleight of hand that proponents of this myth like to pull. That is, citing infant mortality numbers without proper context: in many countries (even "developed" ones), infants with severe or fatal conditions aren't even counted as live births (or are aborted when diagnosed), whereas we do everything we can to save such innocents. One may argue the efficacy of such an attitude, but we value life. "Cancer survival rates in Britain are among the lowest in Europe, according to the most comprehensive analysis of the issue yet produced." Indeed, despite the fact that the "much vaunted NHS" spends more than three times more on health care than Poland, the Polish cancer mortality rate is almost the same as Britain's. So for cancer, at least, increased health care spending does not translate to better health care outcomes. This week's Grand Rounds is hosted by Susan Palwick at Rickety Contrivances. She's using the new carnival template of including all submitted (relevant) posts, but highlighting the creamof the crop. That must have been a challenge, given the 23 posts she's got (and she's also included helpful context with each one). 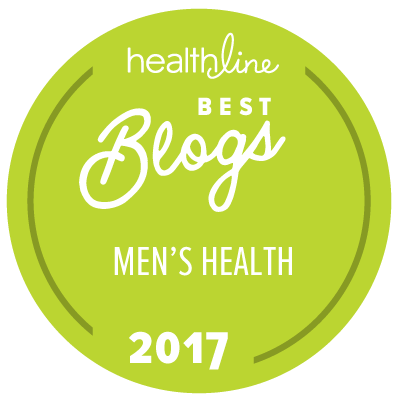 Go check out the best of the medblogs. We posted before on what a Katrina style health plan might look like. Now comes the sequel. It's hard for the average working stiff to contemplate a number as vast as the $23.5 billion the federal government has allocated to Mississippi for Katrina recovery. It's enough money to buy two average-sized houses for each of the 65,000 families in Mississippi who lost their homes. And, there would be enough left over to buy each family a brand-new Honda Accord to drive between their two $166,000 houses. That's the EX-L, V-6 four-door sedan Accord, with all the extras and navigation, not a base model. What does the government think they are doing with OUR money? Apparently they have no clue. As it has with so many things, Katrina has forever changed how federal tax dollars can be spent after disasters. And as with most things in the aftermath of the storm, the rules are in large part being made up as we go along. Well that's certainly comforting . . . I'd originally planned to post this as another in our "Stupid Carrier Tricks" series, but this strikes me as so egregious that the term "tricks" doesn't do it justice. "During the private talks, church members confessed abortions, sexual orientation issues, drug addictions and other dark secrets. No one knew the couple wasn't actually interested in joining the church. Instead, they were private investigators hoping two church members, Bill and Leandra Pitts, would spill something they could use to discredit the pair in an ongoing lawsuit over a traffic accident. The private eyes even tape-recorded the sessions." Turns out, the Pitts' were involved in an automobile accident, in which they were not at fault. They maxed out the at-fault driver's insurance, and apparently filed under their own underinsured motorists cover. Their own carrier, Progressive Northern Insurance Company (which, according to A M Best, is a subsidiary of "the" Progressive insurance folks) instigated this outrageous and morally indefensible action against their own insureds. Well, words appropriate for this family-friendly blog. What these "investigators" were hoping to learn at a church-run encounter group escapes me, but they must have figured that their own ends justified this dastardly means. It seems to me that Progressive owes the Pitts a public apology, and swift, unquestioning payment of their claim. It's the very least they can do. Two jam-packed financial carnivals today. I am simply amazed at (and impressed with) both the number and the quality of the posts. First up, the Carnival of Personal Finance is up at Free Money Finance. Our host picked a Fav Five, out of a mind-boggling 76(!) entries. And he didn't stop there: each one has a little blurb explaining the nature of the post. Kudos! Over at Reasoned Audacity, Jack Yoest presents this week's Carnival of the Capitalists. Presented almost as a story, each post (all with helpful context) seems to flow into the next one. And with over 3 dozen posts, that's quite a feat. Very well done! Several years ago the so-called doc-in-a-box concept cropped up with urgent care facilities springing up everywhere. Well, maybe not everywhere, but in a lot of places. Some liked them. Some didn't. Regardless, they are here to stay and serve a much needed function. That being, providing on the spot medical treatment for minor conditions with little or not wait time. Quicker, more efficient and less costly than a trip to the ER, these clinics are now considered respectable. Now comes the retail based clinics in the form of MinuteClinic, RediClinic and others. These quick treatment centers are located in retail establishments such as WalMart, CVS & Eckerd Drugs. One difference in these clinics and the urgent care centers is, most are staffed by nurses, PA's & NP's. This has some crying foul. But concerns are rising in the medical industry that these operations remain largely unregulated and are prone to conflicts of interest. Some physicians are also concerned that the clinics could disrupt the continuity of care and result in serious underlying health conditions going undetected. Is there a conflict of interest when your PCP refers you to a lab or MRI facility where they have ownership? How about a geriatric physician who suggests you check into a skilled nursing facility he just happens to own? Or a doc writing a script on a pad given to him by the pharmacy in the building where he practices and get's a kickback based on the number of scripts filled there? Is there a conflict of interest when a doc is paid a bonus to keep you out of the hospital or suggest an alternative form of treatment that is less expensive but maybe not as effective? What about docs who are provided with continuing education on an exotic isle, courtesy of a pharmaceutical company? Sounds like the pot calling the kettle black. Carriers view this as an effective cost cutting tool, but would not reimburse for care in these facilities if they felt the care was substandard. A visit to a store-based clinic averages about $60, but a doctor's visit costs twice as much, particularly in urban markets, according to Barry Barnett, a health care consultant for PricewaterhouseCoopers. That compares to about $300 for an emergency room visit, according to Barnett. About 40 percent to 50 percent of clinics take insurance. Hansen-Turten estimated 50 percent of clinic customers pay cash, but she noted that the majority have insurance. In addition to the cost savings, this relieves some of the strain of overcrowding in doctors waiting rooms & ER's. "Drinking wine or beer could reduce the risk of kidney cancer, according to a new Swedish study." I, for one, remain grateful to the Swedes, whose bikini teams and lutefisk extravanazas remain high on my list of "accomplishments which should have won the Nobel Prize" (which, if I'm not mistaken, originated in Sweden, as well). This news, of course, only cements the Scandinavian reputation for cutting edge scientific breakthroughs. Interestingly, the study found that it takes more than the occasional social sip to provide a meaningful firewall against that dread disease: researchers determined that "the risk was reduced in people who drank more than two glasses of red wine a week, or comparable amounts of white wine or normal-strength beer." "A private fire crew dispatched by a national insurance company that caters to wealthy clients is guarding 22 high-end homes threatened by the Castle Rock Fire, a blaze that has forced the evacuation of hundreds of million-dollar homes west of Ketchum." It actually makes sense: if AIG (the firefightin' insurer here) figures the claim's going to top $20 million (22 homes, at least $1 mil apiece), then this is cheap "insurance" to dodge an expensive bullet. It even has the blessing of the Forest Service (why not?). Who knew insurance could be so exciting? You can submit them via Blog Carnival or email.And we still have Fall '07 hosting slots available. Hosting is fun, easy, and gets you off the "nag" list. Just drop us a line! At least one carrier who is relatively new to the individual health market seems to be making a big splash. They rolled in to Georgia 4 months ago with a plan designed to look very much like popular Blue plans. It wasn't enough to come in with wannabe plans, they had to juice it up by "throwing in" a rich dental DMO and vision plan. They set their commission structure higher than Blue and rates about 15 - 20% lower than Blue. They talked about how their plans stack up against Blue in roll out meetings. They even hired folks away from Blue to staff their new marketing offices. Did I mention their rates are 15%+ less than Blue? Oh but, those are just TEASER rates. You see, once the application goes to underwriting all bets are off. Most carriers will give brokers enough information on underwriting that they can prepare the client for the final offer. Most carriers field underwriting guides are 15 - 60 pages. This one is barely 6. Many carriers tell you about how much they will adjust the rates for medical conditions and scripts. This just tells you the rate may be modified. Did I mention their starting rates beat just about everyone? This carrier who is new to the individual business paid (what I presume to be) a big basket of cash to Milliman for an underwriting guide and rate manual. Milliman is perhaps the premier actuarial firm for medical rates & data. They also are ivory tower kind of folks, but then, they ARE actuaries. So it seems this carrier had Milliman set their rates with the idea of insuring mostly folks who can walk on water. Everyone else needs to open their wallet a bit more. I just sent in a case that included a lady with GERD. Some carriers don't charge extra while others will surcharge up to 25%. This one came back with a 50% rate up. Had it been 51% she would have been declined. What kind of idiocy is that? Of course my client is not happy. Neither am I. This makes me look like I don't know what I am doing and in the case of this carrier that is true. They don't offer pre-screens. They don't want to tell what underwriting MIGHT do. We are expected to trust them. Trust them to be totally unpredictable. This fall, United HealthCare is coming out with some new group plans (yippee). One of the interesting "twists" is that the co-insurance reimbursement rate (the "80" in "80/20") will be substantially lower for patients/insureds who choose not to go to a "designated provider." That is, it's not enough that your doc is "in the network;" he must be "designated" ("super qualified," whatever) in order for you to receive the best level of benefits. UHC's new program isn't unique, but these programs raise some interesting questions. Perhaps the most curious would be "okay, that's nice, but what about the other doc's, the ones who didn't make the cut?" Not that this is anything new: a few months ago, we reported on the case of Dr Michael Kelly, who was unceremoniously dumped by both Blue Cross and United. Well, not "dumped," per se, but no longer designated as a "high quality doctor." The tip of an iceberg, perhaps? Well, you may not be surprised to learn that physicians like Dr Kelly are not happy campers. Over at Managed Care Matters, our friend (and sometimes foil) Joe Paduda reports on the steps these "also rans" are taking to regain their good names (and cash flow). And as is usual at MCM, the resulting comments are every bit as interesting as the post itself. Daniel Goldberg, blogging at Medical Humanities, presents this week's amazing HWR. In addition to excellent posts (presented in an easy to follow manner with lots of useful context), Daniel takes the time to explain medical humanism in the context of both Martin Luther and the Catholic Church (although I'm puzzled as to why he left out Spinoza). In an interesting (and unusual) twist, Daniel put my post (debunking a recent Reuter's article) at the top, and then proceeded to argue with it. In fact, he responds to almost all the posts. I think that's great: the point of blogging, IMHO, is to elicit conversation and reactions. As an insurance agent myself, I found Brian Klepper's series on the value of my chosen profession to be quite interesting. Brian's been subbing for medblog biggie Matthew Holt, and he's not convinced that brokers are really worth what we're paid. While I disagree with his conclusions, I do agree that there are definitely some areas where we need to do MUCH better at policing ourselves. Recommended. Don't hear much about that any more. Maybe workers are getting smarter. But it's also another day without health insurance. Tell me, why are they striking? One union leader tells us the union does provide catastrophic insurance. But he did not want to go into anymore details. That gives me a lot of confidence in their leadership. 5 days on strike and already they are hurting. So, whose idea was it to go on strike? HOW can anyone not agree with free universal high-quality health care? Free health care. Seems like there is ignorance down under, not just here in the states. How can anyone think that our current public/private marriage of political convenience is beneficial to all Australians both now and in the future? Mix of public (taxpayer funded) and private insurance. If the public (taxpayer funded) plan is so great, why does anyone need private insurance to subsidize? No one ever addresses that question. No one gets a private plan to subsidize public housing. So why health insurance? Having private health insurance is not a choice. The poor, the old and the vulnerable wait in pain. The rest get served first. Doesn't sound like the public system is all that great. Last week I found myself on the Medi-Go-Round. It was one of those "it's probably nothing, it's probably nothing, it's probably nothing, maybe it's cancer" scenarios. After six months of niggles that had grown to excruciating discomfort, I was off to the doctor. There was talk of having something removed. I don't have private health insurance. I've never had it. I'm politically and philosophically opposed to it. Politically & philosophically opposed to health insurance. Would rather put up with the niggles. According to accounting/research biggie PriceWaterhouseCooper (PWC), the incredible acceleration of health care costs (and hence, insurance costs) is beginning to ease up. 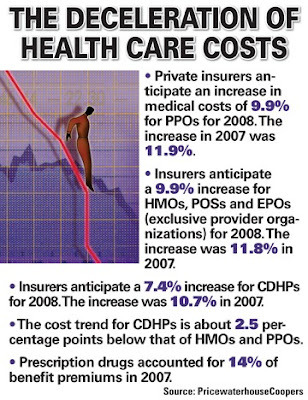 PCW discussed health care cost trends with a number of insurers, who expect "trend" to top out just under 10% for 2008. This is actually lower than the double-digit numbers we've seen the past few years. It's important to remember that trend is not the same as rates. That is, how much higher health care is expected to be is but one factor in determining how much an insurer will charge. Lower trends have a positive impact on rates, of course, which is good. It also underscores our mantra here (originally and succinctly promulgated by Mike Feehan) that "health insurance costs increase because health care costs increase." Amen. There's actually a lot of interesting information in the report; for example, carriers are expecting prescription drug costs to slow down a bit, an increase in EMR and other digital applications, and more widespread adoption of transparency tools. According to the report, prescription drug costs accounted for some 14% of all health care costs this past year, while physician charges represented the lion's share (35%). I was pleased to see that HDHP rates are expected to rise much less (25% less, in fact) than more "traditional" HMO and PPO plans. That's good news, indeed. Of course, by shifting some of the costs of health care back to those who actually use it, it follows that there would be more careful utilization, resulting in lower health care expenditures (and cost). Kind of a win-win deal. The report itself is pretty easy reading, and is available (in pdf form) here. The medical student who runs Med-Source has put together a terrific Grand Rounds for this week. With over 20 posts, helpfully categorized with interesting commentary, it's a real delight to behold. One of the hats I wear is Continuing Education instructor (for insurance). We do ours the old fashioned way: live and in-person lecture format. We've toyed with the idea of moving at least some of our efforts into online courses, but haven't quite bitten the bullet yet. No so with with Nurse Kim from Emergiblog; she's about to start her 2nd semester of classes using the online model. Working toward her BSN (Bachelor of Science in Nursing), she's actually increased the number of hours she's putting in using her PC and the 'Net to attain her goal. Kudos, Kim! Regular IB readers may recall our recent post about gaming award nominee Fat Dragon, in contention for the coveted Ennie Award for Best Miniature Product. We had asked for your help in making this entrepreneur's dream come true. Well, I just received a phone call that FD has, indeed, won the award, the very first time it was even nominated. Mazel Tov, Tom, and we're proud and delighted to have been of help! Blogger Trent of The Simple Dollar hosts this week's edition. As has become somewhat customary, he's chosen a "Top 10" list, followed by the rest of the entries that were submitted. And this week's Carnival of the Capitalists is available at Revenue River. Host Scott Allen presents a terrific compendium of capitalistic posts. And there's this: we've been noticing that the Cavalcade of Risk has been receiving a lot of "spam" posts -- pieces allegedly written by bloggers but in actuality nothing more than press releases -- and apparently the CotC has been receiving similar garbage. What's terrific is that Scott has called them out on it, and actually published the names and links of the offending bloggers. Bravo, Scott, bravo! Medicare will stop paying the costs of treating infections, falls, objects left in surgical patients and other things that happen in hospitals that could have been prevented. One one hand, I agree. Why should the taxpayer pay for things where the hospital (or other negligent party) is clearly liable. On the other hand, who is going to decide the liability issue? Are the hospitals going to readily admit their wrong? Will the patient be caught in the middle? "Our efforts in this arena and in other payment rules are to ensure that CMS is an active purchaser, not passive payer, of health care,"
That should be the case with any payor. It doesn't matter if the payor is the taxpayer, the carrier or the individual. Hospitals in the future will be expected to pick up the cost of additional treatment required by a preventable condition acquired in the hospital. "The hospital cannot bill the beneficiary for any charges associated with the hospital-acquired complication," the final rules say. This implies that hospitals could bill CMS with impunity in the past. Who made this rule? Last year, Mark McClellan, then director of the Medicare and Medicare programs, said the government could save hundreds of millions of dollars a year if the Medicare program stopped paying for medical errors such as operations on the wrong body part or mismatched blood transfusions. Operations on wrong body parts. I don't want to go there. Private insurers are considering similar changes. And they should . . .
Too Much Scotch in the Water? "CANCER patients are still waiting up to seven months for treatment. Patients are supposed to be treated within 62 days of urgent referral...In the worst cases, sufferers were kept hanging on for 220 days." To be fair, some 85% of Scottish cancer patients are seen in the recommended "window" of 62 days. However, the two-year old target is 95% of those affected to be seen in that time frame. One region, Lanarkshire, "had the poorest performance, with just 70.3 per cent of patients being seen within the target time." Ooops. Our neighbors to the north strive for a 66 day maximum wait. In fairness, I have not been able to find the relevant numbers for the US. I encourage IB readers to share that information (with links and facts) in the comments section; I'll update this post early next week. We recently posted on shipping mom & dad overseas to India for nursing care. It seems you don't have to go that far to get a deal. How does mom feel about Mexico? For $1,300 a month — a quarter of what an average nursing home costs in Oregon — Douglas gets a studio apartment, three meals a day, laundry and cleaning service, and 24-hour care from an attentive staff, many of whom speak English. She wakes up every morning next to a glimmering mountain lake, and the average annual high temperature is a toasty 79 degrees. So the staff speaks English, huh. Guess that means the menu doesn't have pictures where the guests can point to the Value Meal for $3.95. "It is paradise," says Douglas, 74. "If you need help living or coping, this is the place to be. I don't know that there is such a thing back (in the USA), and certainly not for this amount of money." $1300 per month, that's $43 per day. About the price of a Motel 6 in the U.S.
"You can barely afford to live in the United States anymore," said Harry Kislevitz, 78, of New York City. A stroke victim, he moved to a convalescent home on the lake's shore two years ago and credits the staff with helping him recover his speech and ability to walk. I haven't been to NYC in a while. Last time was probably 25 years ago. I do recall breakfast at the Sheraton was expensive. Seems like I had a glass of OJ ($4), one egg ($2.75) and "assorted" toast ($4). Turns out assorted toast was one whole wheat slice, one rye. Richard Slater has a good deal too. He gets 24-hour nursing care and three meals a day, cooked in a homey kitchen and served in a sun-washed dining room. His cottage has a living room, bedroom, kitchenette, bathroom and a walk-in closet. That's $140 per YEAR for health care, not per month. I may have to look into this. From time to time, we highlight some the effects of government-sponsored health care rationing in countries touting "universal health care." And much like those gloves that promise "one size fits all," such schemes generally end up fitting everyone poorly. Such is the case of the Scottish health care system's recent decision regarding the use medications such as Aricept. In its infinite wisdom, the Scottish National Institute for Health and Clinical Excellence (NICE) labeled that class of drugs as "not cost- effective in early Alzheimer's." The med will apparently still be available to folks in the later stages of the terrible disease, but not those recently diagnosed, who may have seen their declining condition slowed somewhat. Notice that they didn't say "non-efficacious." They simply classified them as cost ineffective. On the one hand, perhaps they're right (after all, they're responsible for saving Scottish dollars (pounds? euros? whatever), and here's a quick and easy way to do just that. On the other hand, this action removes another potential tool from MacDocs seeking to treat their senior patients. I guess it's bad news for Nessie. WARNING: What follows is a mini-rant only tangentially involving insurance. I think the Darwin Awards are a hoot: these are little newsbits about the various and imaginative ways foolish people have used to remove themselves from the gene pool. I also think mandatory helmet laws are bad: I think morons that choose to ride without helmets should be free from government-mandated encumbrances. But I also think that those who do choose to ride without a helmet should be willing to take the personal responsibility that comes with that choice. I would support a law which said that such folks are entilted to no special lifesaving services (up to and including CareFlight) if and/or when they become one with the undercarriage of a Mac truck or Chevy Malibu. Alternately, I would support a law which states that folks who ride helmetless have explicitly empowered the state to harvest their (usable) organs immediately, with no medical care due other than keeping such folks alive long enough to get those organs safely to the nearest hospital. Okay, I'm done; thanks for listening. Cavalcade of Risk #32 is up! Thanks to Chris Burdick for an outstanding Cavalcade of Risk. He stepped in at the last minute, and did a great job. Check it out. And consider hosting your own Cavalcade edition. Just drop us a line for details. In a move that stunned many, behemoth toy manufacturer Mattel announced a recall of millions of toys. This was the second recall in two weeks. So what does this have to do with insurance? Quite a bit. Mostly on the P&C side but it can also impact the health of our children and may have a ripple effect on health insurance costs & premiums. Of course this is not just about Mattel, or toys. The picture is much bigger. But the latest recall could feed growing international worries about the quality and safety of consumer products made in China. It would follow a series of other recalls by manufacturers this year involving a wide range of products from contaminated pet food ingredients to defective tires to tainted Chinese-made toothpaste. Food products, toiletries, toys. Will the list continue to grow? In a desire to deliver cheaper products to the American consumer manufacturers of all kinds of products are continually outsourcing the manufacturing to foreign soil where cheap labor rules. The result is products that are unsafe and could cause harm to those who use them. Earlier this month, Mattel recalled over one million toys, including Sesame Street and Dora the Explorer products made by its Fisher-Price unit because they were contaminated with excessive levels of lead paint, which if ingested could pose health hazards to children. Mattel said Lee Der Industrial was responsible for producing the toys that contained excessive levels of lead paint. Lead paint has been banned in the U.S. for years due to health hazards. Parents are being warned not only to check out toys in use but to be concerned about the health of their child if the toy has been in their possession for more than a month. Parents who suspect their child may have ingested toxic levels of lead are being encouraged to take their child to their pediatrician for testing. The problem with lead poisoning is that the symptoms & side effects may not manifest themselves for years. If your child has any of these symptoms of lead poisoning and he is at risk for lead exposure then you should see your doctor immediately. Most children with lead poisoning do not have any symptoms, so if your child is at risk you should still have him tested even if he is not having any problems. If your child starts to show symptoms of lead poisoning, you may not be able to trace it back to a particular source. That means the financial burden of treating and caring for your child could fall on your health insurance plan. This is a Pandora's box no one wants to open. I'm among that group of fans who believe that Dr No was the best Bond film of the genre (although the newest reimagination was pretty darned good). But this post isn't about the fictional Spectre villain; (Dr) Tom Coburn is the Oklahoma Senator who's earned that epithet for his frequent use of "holds" to bottle up bills that "violate his core principles." And which kinds of bills are those? Well, they include "any new federal program that is not paid for, or anything that might duplicate another program, or anything that might be unconstitutional." And that's why he's put the (temporary) kibosh on the Senate version of legislation prohibiting the use of genetic information in insurance underwriting (H.R.493). Among other things, the bill would "prohibit a group health plan from adjusting premium or contribution amounts for a group on the basis of genetic information." On the face of it, the bill seems innocuous enough: after all, why should folks be penalized for things over which they have no control (i.e. their genes)? Would that it were that simple. But the fact is, such prohibitions already exist at the state level, so a federal limitation would be redundant. Even more important, it's a bad idea: underwriters have a number of tools at their disposal, and genetic testing just isn't one of them. But for the sake of argument, let's say that it was, and that it was used. How is that any different than testing for HIV, or tobacco, or cocaine? On a group basis, any one of those factors may (or may not) go into the mix in order to arrive at a reasonable final rate. Thanks to HIPAA, groups can't be declined on the basis of health, and states have put caps on how much a given group may be surcharged. Speaking as one whose own genetic makeup would fall squarely in the sights of such a tool, I would have no problem with its use. Why not? Because insurance is a mechanism of risk management, and in order to effectively manage a given risk, one must have an accurate assessment of it. There's another problem with the proposed legislation, as well: it's poorly written. How's that, you may ask? Well, as "Dr No" points out, "the current language of the bill is that the definition of genetic test is inconsistent.” One has only to read the bill to see that this is so. While that may seem an excercise in picking nits, it is actually a major flaw: since the definition of what constitutes such a test is fluid, the trial bar would have a field day interpreting what underwriters use as criteria in their assessment of a group. This in turn could (would?) lead to even higher premiums. Suppose you had a business. A business that provided a much needed but expensive service. A business that can literally change the lives of people. You strategically place your business in an area where you can expect optimum traffic. You are required by law to offer your services to anyone who needs them regardless of their ability to pay. Some people who come in the door of your business will have unlimited lines of credit to pay their bill. Others will have only what is in their pocket. Those with lines of credit will pay their bills at 50% of your going rate. Those without a line of credit will only pay about 8 - 12% of billed charges. Have you figured it out yet? Who am I? Bad debts are increasingly driving a little-discussed vicious circle. Hospitals seeing more debt from insured patients can react by pushing insurers to help them offset it. This in turn can push insurers to charge higher premiums to employers, which can force employers to place more of the risk of healthcare costs on to their employees. We are a nation who is overweight, over-stressed and have demonstrated an ability to take on more debt and save less than any prior generation. We are also more lax in accepting personal responsibility for our debts. When is this cycle going to stop? What do many do when they are sick? Call a doctor? Call mom? Ask a friend or relative? They get on the internet. Nothing as long as you know where you are going and have an idea about the accuracy of the information that comes up. Microsoft’s software animates more than 90 percent of all personal computers, while Google is the default starting point for most health searches. And people are increasingly turning to their computers and the Web for health information and advice. A Harris poll, published last month, found that 52 percent of adults sometimes or frequently go to the Web for health information, up from 29 percent in 2001. 52% go to the web in search of answers. But what kind of answers are they getting? According to the Harris survey, 58 percent of people who look online for health information discussed what they found with their doctors in the last year. This is a good thing, up to a point. But how many people will self diagnose, and then self treat a problem that may be more serious than they suspect (or even want to admit)? How many more will find themselves disagreeing with the doctor, and then start looking for a practitioner who will confirm their diagnosis? Yet personal health records promise to be a thorny challenge for practical and privacy reasons. To be most useful, a consumer-controlled record would include medical and treatment records from doctors, hospitals, insurers and laboratories. Under federal law, people can request and receive their personal health data within 90 days. But the process is complicated, and the replies typically come on paper, as photocopies or faxes. Protected health information is a thorny topic. How will this information be handled without compromise? This week's Grand Rounds, hosted by Christian at Med Journal Watch, focuses on change: for the better, for the worse, or "just 'cuz." And each of the 40(!) posts has an extensive description of the content and context, which makes it even more interesting. We've written a lot about "mini-meds" over the past year or so; David Williams, proprietor of the Health Business Blog hasn't been a big fan of them. But he's gradually coming around to seeing that they may offer some value. An interesting and thoughtful journey. A potential merger between two major health insurance companies that would affect hundreds of thousands of Nevadans has critics worried about potential abuse. That merger would be between UnitedHealth Group and Sierra Health Services. "A monopoly is a monopoly no matter what face you put on it," said Carol Austin-Fink, cancer survivor. Austin-Fink is a cancer survivor. She's against the merger because she says UnitedHealth denied her claims for jaw and mouth treatments after chemotherapy. But she's not the only one casting a critical eye. "Nevada does not need a monopoly on insurance products. Isn't universal health insurance a monopoly? Someone please explain the difference to me. This week's Carnival of the Capitalists is hosted by Spooky Action, blogging out of hot, arid Arizona. He's got a very cool carnival, though, with 4 dozen posts. He also has a "Top 10," which includes our very own Bob Vineyard's post on health care costs. Yay, Bob!! Since we're on the subject of sensitivity, I found this post on how to respond to racist humor to be quite timely. Carmen Van Kerckhove blogs at Race in the Workplace, and has some helpful tips. Costco now offers small-business health insurance plans in Nevada, Oregon, Hawaii, Washington and California. Offers in each state are different depending on which insurance company the retailer partners with, but the company promises to offer a better value then business owners can get by themselves. This is a good idea as long as it works. Plans like this have been tried before without much long term success. Eventually it starts to fall apart. Premiums start to rise to cover claims. Those who are healthy enough to find something better leave. New entrants drop off and the plan goes into a death spiral. This might be different. Only time will tell. By combining numerous small businesses together into one health care pool, Costco is able to get better insurance rates. The company also tries to negotiate cheaper high-deductible insurance policies that carry enough benefits to be feasible. The discount is also due to lower commission to Costco and lower administrative costs. Unlike other insurance brokers, who manage a large number of plans, Costco only manages one or two in every state — the same way the company runs its warehouse stores. Lower commission. Group insurance usually doesn't pay that much commission to start. Only offering 1 or 2 plans is nice but has minimal impact on the rates. Between a lower commission and (presumably) lower admin fees, I can't see a savings of more than 2 - 4% overall. The insurance service is not a profit driver for Costco, but the company says it fits perfectly into serving its most important customer base, small-business owners, who make up one-third of its members and contribute two-thirds of its revenue. Not a profit center? So this is a loss leader? Some state governments are also experimenting with insurance-pooling ideas to support small-business owners. Most recently, Oklahoma expanded a program under which the state pays 60 percent of the insurance costs for small businesses by moving some Medicaid dollars that were used to pick up the bills for the uninsured. But one problem with most state-sponsored insurance pools is that they often experience low enrollment and higher administrative costs. Minnesota installed a public-administered program in 1993 but discontinued it five years later due to lack of financial viability. Wonder how many of the states who have recently decided to get in the insurance business bothered to check out the MN plan? If the answers were easy everyone would be jumping on the wagon. "HOSPITAL staff in the Lothians* have been told not to eat at their desks to avoid offending Muslim colleagues during Ramadan. NHS Lothian has advised doctors and other health workers not to have working lunches during the 30-day fast, which begins next month." While I'm all for folks having the freedom to worship as they please, this seems to me to be going overboard: does the NHS prohibit its non-Jewish staff from eating breads, buns and doughnuts during Passover? Of course not (or so one would hope); each of us should be free to practice our faiths as we see fit, but elevating one person's faith above everyone else's (which is exactly what this edict does) is demeaning and insulting. Bill Aitken, a Scottish legislator, seems to have the best take on the situation: "Frankly, this advice, well meaning as it may be, is total nonsense. This is the sort of thing that can stir up resentments rather than result in good relations." This is a medblog, not a poliblog, but FoIB Joe Kristan has an absolutely brilliant, funny, pithy fisking of a fellow blogger's disdain for Joe's beloved Hawkeye State. If you need a chuckle (and perspective on the Ames straw poll), head on over to Roth & Co.
Over at Abducens Nucleus blog, the physician/host has a powerful, detailed takedown of the rose-colored picture many folks have of nationalized health care schemes. "One in three households surveyed tried and failed to gain timely access to at least one health service within the previous three months. And in one study, the total waiting time between referral from a general practitioner and specialty care averaged nearly 18 weeks. Even the Supreme Court has weighed in on the unacceptable delays in care. But the lawsuit is not against a dreaded American HMO and the events did not happen in the U.S. All were byproducts of the Canadian health care system." "(T)he folks in the ER at Los Angeles' Martin Luther King Jr.-Harbor Hospital and two different 911 dispatchers, who refused to send an ambulance to help the poor woman find some of that reasonable and necessary care. As a result, the 43 year old woman died of massive internal bleeding." "Martin Luther King Jr.-Harbor Hospital shut down its emergency room Friday night and will close entirely within two weeks, a startlingly swift reaction to a federal decision to revoke $200 million in annual funding because of ongoing lapses in care." On the one hand, that will most certainly create a major health care shortage in that area of LA; on the other, I'm not convinced that's a bad thing, compared with the incredibly poor care MLK was providing. Hat Tip to Captain's Quarters. "An alliance between the Health Alliance -- minus two members -- and Premier Health Partners could be in the works...the Health Alliance and/or Jewish Health System are exploring a merger or affiliation with the Dayton system." Gee, didn't see that one coming. The reality is, as problematic as the health insurance market is hereabouts, it's really no more dysfunctional than the health care market. And, as we've pointed out numerous times, the latter drives the former. If I had to guess (and heck, that's the beauty of blogs: we get to opine all the livelong day), I'd say that this bodes more seriously for the Cincinnati market than the Dayton. Why, you ask? Well, Premier has recently signed relatively long-term deals with the two 800 pound insurance gorillas (guerillas? ), Anthem and UHC. But the Cincinnati market is in flux; it's a much larger market, as well, serving southern Ohio as well as northern Kentucky. The truly interesting geographical wild card here is Middletown (so-called because it's roughly halfway between Dayton and Cincinnati): Premier is based in Dayton, but "owns" Middletown Regional (MRH), which also serves the northern suburbs of Cincinnati. The two outlyers (Christ Hospital and the St. Luke's) left the Cincinnati-based Health Alliance earlier this year, presumably hoping to make up for lost contracts with increased revenues. Looks like they may have miscalculated. The two larger communities continue their inexorable crawl towards each other, which may ultimately leave MRH in an enviable position. Of course, Christ and St Luke's are now calling foul, but it seems to me that their own voluntary exile from the Health Alliance mitigates any such claim. The real winners here may be us consumers, as competition drives down costs. On the other hand, the real losers here may be us consumers, as former competitors link up, squelching competition. "Adults aged 19 to 29 are the biggest group of the newly uninsured, according to an independent research group's report released on Wednesday." The Commonwealth Fund's report claims that these folks comprise almost a third of those without health insurance (if one buys the 45 million number, which we've disputed numerous times). Of course this group of "invincibles" represent a disproportionate number of uninsured folks (whether by choice or not). "Young adults, many who are [sic] just entering the workforce and can't afford the high cost of individual insurance." Of course they can, but many (most?) choose not to spend their wages on something which they perceive (rightly or wrongly) as a waste of money. This is actually a much bigger problem than the report suggests: insurance carriers have strict participation requirements, mandating that a certain percentage of eligible employees sign up. When these "young invincibles" take a pass, the group suffers. And there's a more insidious implication, as well: since the insurer essentially considers the premiums young folks (especially males) pay as "free money" (because their expected claims are so low), they help to subsidize older employees' premiums. One may argue the fairness of that situation, but not the fact that it is so. Of course, young 'uns are the the beneficiaries of some of the most intense insurer marketing campaigns we've seen recently: Anthem's Tonik and UHC's Belay plans are aimed squarely at this demographic. And why not? They have disposable income and few responsibilities. "U.S. Census and other data cited by the report show 40 percent of the uninsured young are in households earning less than the federal poverty level." Oh! It's an attempt to draw a correlation between two distinct groups of people: those who choose not to buy insurance (the 30%) and those who have access to myriad government-sponsored care (the 40%). Nice try, guys! Frankly, the only really surprising thing here is that the 30% number seems low. And finally, this little nugget: "the nonpartisan Commonwealth Fund." According to OpenSecrets.org, CF's Chairman, Dr Samuel O. Thier, donated $2,000 to John Kerry's presidential campaign (and $0 to Geo Bush's). And its President, Karen Davis, contributed some $600 to America Coming Together, a liberal advocacy group, as well as $250 to the DNC. Now, there's absolutely nothing wrong with folks making political contributions as they see fit. But "non-partisan?" Hardly. You can via Blog Carnival or email. And we still have Fall '07 hosting slots available. Hosting is fun, easy, and gets you off the "nag" list. Just drop us a line! Happy Blogiversary, Jay & Louise! 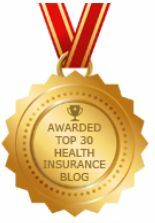 Our esteemed colleagues and blog-buddies at Colorado Health Insurance Insider celebrate their blog's first anniversary today. In that short time, they've already hosted the Health Wonk Review and the Cavalcade of Risk, and posted countless interesting and insightful articles on health insurance, including their own personal "adventures" in the health care jungle. In their most recent report on Consumer Driven Health Care, the wise physicans of the American Medical Association concluded that "the overall picture that is emerging dispels concerns that CDHC plans attract only the "healthy and wealthy...CDHC is serving as a catalyst for greater price transparency and public awareness of health care costs." You'll get no argument from me, of course. So why, then, are these same health care providers knocking on the burgeoning retail-based clinic model? You know the ones: they're found in Sam's Club & Costco, and in your neighborhood pharmacy. They're convenient and affordable; in fact, since most take no insurance, a lot of expensive overhead goes away altogether. Perhaps best of all, they're models of transparency: prices are prominently displayed, and everyone pays the same. Well, that's another post; but the point is, institutions that purport to embrace transparency and accountability (and yes, AMA, I'm talkin' to you), shouldn't then be advocating for "prohibitions against advertising that compares the fees of convenient care clinics with those of physicians."